Holding A Fray includes new videos and photographs by Dru Donovan. In the video Contact, a woman bends forward, hands bracing her knees, while a man lays across her back, their spines touching with his face turned towards the ceiling. Both figures balance their weight and strength intuitively maneuvering their bodies through small fluctuations. Their movement implies a team-building exercise, a stretch, a sustained choreography, or a disaster simulation. The action is unrecognizable, simultaneously cooperative and at odds. The viewer's inability to parse or place gesture is common to all the work in Holding A Fray. Donovan's videos and photographs give no sound, no history or purpose, and no entry or exit; they leave us with just a physical negotiation, one that simultaneously suggests affinity and belies subtle force. Through culture and experience, we are taught to discern harm from care, subjugation from cooperation, and intimacy from intrusion, but Donovan's work strips the usual clues– context, identity, motivation– that allow us to believe we understand. This confusion points to a troubling ambiguity at the heart of interpersonal interaction: that force and care cannot be untwined. Donovan's ambivalent gestures dwell in this nuance, and Holding A Fray lets us consider that in cooperation, we're still individuals, and in conflict, we still relate. Dru Donovan is an artist living and working in Portland, Oregon. She received her MFA from the Yale School of Art and a BFA from the California College of the Arts. Donovan has shown internationally in There's Something Happening Here (Brancolini Grimaldi, London, England: 2012), reGeneration2: Tomorrow’s Photographers Today (Musée de l’Elysée Lausanne, Switzerland: 2011), and the California Biennial (Orange County Museum of Art, Newport, CA: 2010). 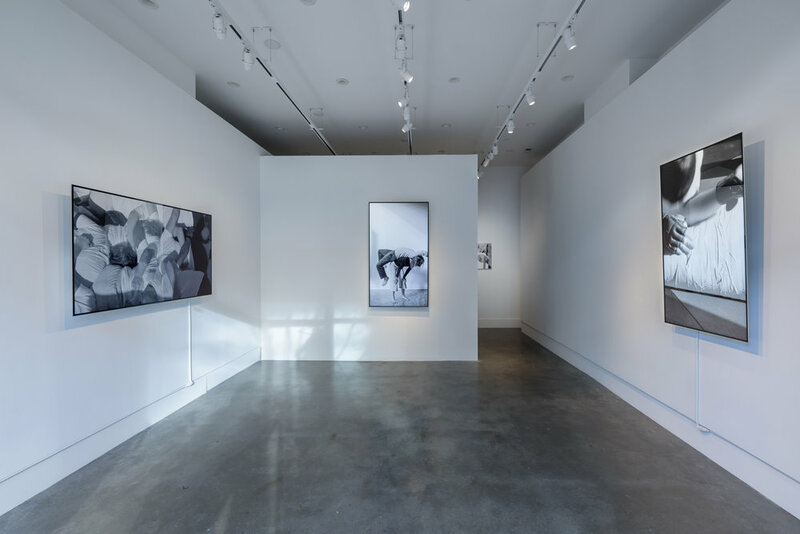 Recent group exhibitions include Positions Taken (Vox Populii Gallery, Philadelphia, PA: 2017), The Heart is a Lonely Hunter (curated by Katy Grannan, Fraenkel Gallery, San Francisco: 2015), Desire (Yancey Richardson Gallery, NYC: 2013). Donovan recently presented her work in Portland with the solo exhibitions Basic Poses (Melanie Flood Projects, Portland: 2017) and Carving The Lung (Hap Gallery, Portland: 2015). Her photographs have been published in such magazines as Aperture, Blind Spot, Picture, and Matte. Donovan’s works are in the collections of Deutsche Bank and the Los Angeles County Museum of Art. In 2011, TBW Books published her first book, Lifting Water. In 2011- 2012 she participated in the LMCC’s Workspace residency. Donovan is a 2016 John Simon Guggenheim Memorial Foundation Fellow.